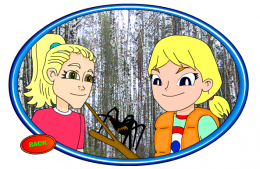 Theme unit and stand alone lesson plans to accompany Maggie’s cartoon adventure, “Rushin’ River”. A Cartoon Scavenger Hunt! Your students will have fun, gain needed practice in identifying details, and learn more about Russia when doing this scavenger hunt about our cartoon, ‘Rushin’ River! Integrated lesson plans to accompany this beautiful picture book by Corrine Demas Bliss for primary students. Tales from Russia and activities based on multiple intelligence theory to enhance understanding of the literature. Learn more about this famous Russian handicraft and design your own set of dolls! Discover this unique Russian teapot that sits everywhere – from Russian homes to Russian trains! Give your students practice in understanding the relationship between the metric system and the English system by using these measurement facts about Russian animals. Math is tasty when you cook up some blini problems! Multiple your matryoshkas when you explore beginning multiplication concepts. Students will learn about the vastness of this country while completing time/ distance problems and explaining their answers. Four Critical Thinking Geography Activities – Explore maps and our changing world with these four thought provoking articles and activities. Three biomes are prevalent in Russia – read about them and learn more by completing these meaningful follow-up activities. Find out about the eating habits of the Russian people. Discover this unique Russian “teapot” that sits everywhere – from Russian homes to Russian trains! Read about the arctic tundra – imagine yourself living in this frozen Russian landscape. Included are some fun science experiments. Learn the ways a species can invade an environment by performing this experiment. Your primary students can practice logical thinking skills when completing this activity. Your intermediate students can practice logical thinking skills and will learn more about St. Petersburg when completing this activity.